April 26, 2015 ~ Trevis Dampier Sr.
Today I was in for a special treat for breakfast as you are in for this special treat right now my friend! We would run in the house as quick as we could and this sweet smell of some mystical creation by my mother’s hands was laying on the table. “What were these cake looking things?” I would say to myself. I don’t know but knowing my Mom they were tasty. I would take a fork and slice it oh so gently since it was so easy to pass the fork through and when I bit into this fried cake it gave me the utmost satisfaction as a kid. It was light and flavorful with a crunch added to it that leaves you in a mode of excitement upon every bite. It leaves you begging for more and more and it really gets interesting when you add a mustard dip. Now the party really can get started! This is how I felt as a kid growing up so when I walked down the stairs this morning and smelled this southern delight of enlightenment of the soul I dug in quickly. All the memories came back instantly of my childhood; the sweet taste of the salmon, combined with this fried crunch which left me in awe as I continued down this freeway of desirable satisfaction. Combined that with eggs for breakfast and this makes the perfect meal of choice for an exotic and elegant morning experience. True live action eating! 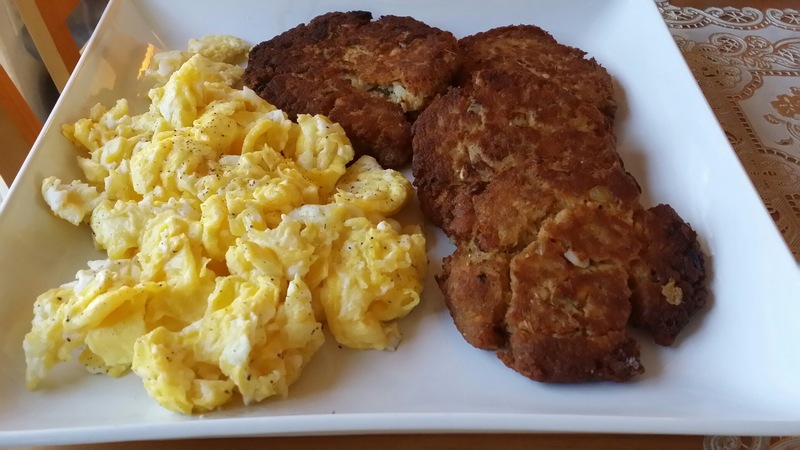 If you have never tried Salmon Croquettes then I highly suggest you take the time to make this with my Mom’s recipe on the top of this blog. I guarantee you won’t be disappointed! Well thanks everyone for joining me on today’s adventure! I look forward to seeing you on the next run! Keep hope alive! < Previous Like a Dankhead to Ganja..This Foodie Loves Me Some Lasagna!! Next > I’ll get Poetic like Charles Dickens for some Barbecue Chicken!